This morning on board the Cetacea for the 9am whale watch, we headed toward the northern edge of Stellwagen Bank, where all of our whale activity has been. About 20 minutes before reaching the bank we came across a lone humpback. It was Hancock. She was doing short fluke up dives. We didn't stay with her long because we still had some time to travel to get to the bank. As we got to the bank, we started seeing blows in all directions. I believe that there 15-20 whales in the area. We also saw the water "bubbling" with bait with lots of scattered seabird activity. First we spent some time with the two closest humpbacks that were logging or resting. 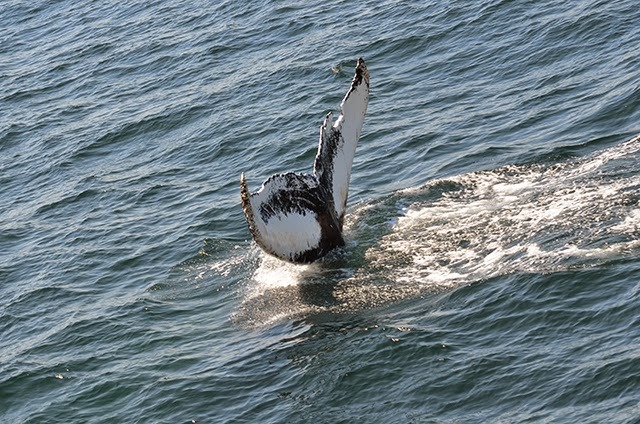 Luckily after a little while the two humpbacks awoke and took a fluke up dive! It was Conflux (T5) and Sprinkler (T4). 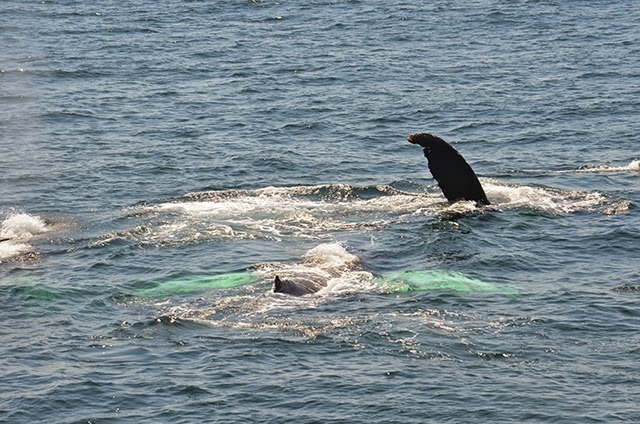 Then we moved forward to a group of three humpbacks: Jabiru, Glo-stick and her 2014 calf. These three were traveling and taking fluke up dives. We then saw some splashing about 2 miles away so we went to investigate. It turned out to be Milkweed's 2014 calf breaching. Soon after arriving, Milkweed and her calf were joined by a nearby trio of Scratch (T5), Pele (T3), and Pivot (T2). We finished the trip with these 4 adults and 1 calf all taking fluke up dives about 150 yards off the boat. On the 1:30 trip we returned to the same location as our earlier trip. Just like before, as we got to the bank, we spent some time with 2 logging humpbacks. This time it was Cat-Eyes and Nimbus! We didn't stay long with these two because we didn't want to bother their resting so we moved forward. Next we saw Pele and Pivot doing some non-linear traveling. We also spotted Sprinkler nearby! We finished our trip with another new sighting for us this season, Pinch (T3)! Overall, it was an excellent day out on the water filled with lots of new sightings. Today on board the Asteria we had a very unique whale watch! 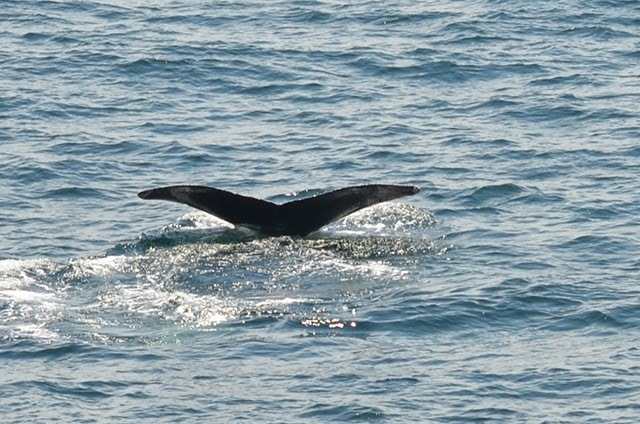 First, we were excited to spot a minke whale and a humpback whale only about 14 miles from Boston. The humpback whale turned out to be none other than…Hancock! She was doing her typical bubble net feeding. After a little while we decided to move on to see if we could find anything else. After communicating with our 9:00 whale watch, we were given the location of even more activity. Along the way we caught a quick glimpse of a finback whale as well as another unknown mysticete, but we decided to continue on to where the Cetacea had been earlier that day. 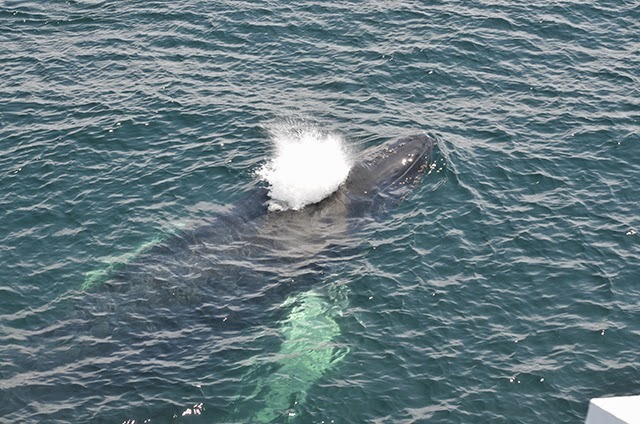 Once we arrived we were glad to see many groups of humpback whales! The first group we saw was logging and included Jabiru, Milkweed and her 2014 calf! We moved ahead to take a peek at a few other scattered groups. It appeared as though most of these groups were logging as well, possibly recovering from the feeding frenzy we witnessed earlier in the week. On board today were members of the Stellwagen Sanctuary Seabird Stewardship Program who were conducting a survey of the seabirds in the area. I must say they got a lot of data today because there were tons of greater, sooty and cory shearwaters out on the water today. They also spotted a very rare South Polar Skua! We decided to make a turn and view one of the earlier groups when all of a sudden…BREACHING (see picture at top)! The logging group of humpbacks from earlier all decided to breach. As if this wasn’t exciting enough, this group headed in our direction and surprisingly surfaced right next to the boat! It was a stunning finale to our already spectacular trip. 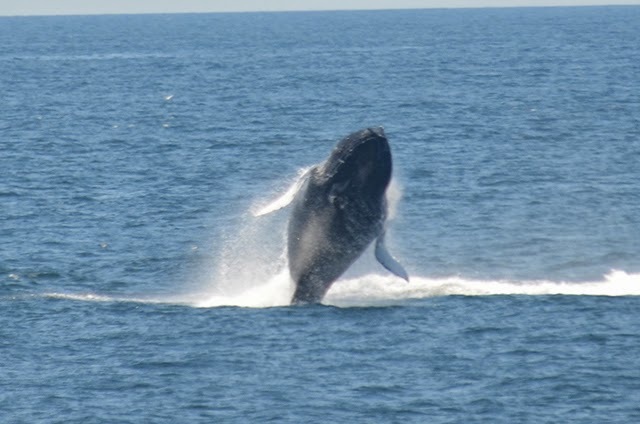 Another amazing day for humpbacks! After the past few days of feeding frenzy, its like the whales are sleeping off the excess sand lance they’ve been gorging. It was beautiful out on the northwest corner of Stellwagen with light winds and light seas. We spotted whales almost immediately and approached a pair that seemed to be resting or logging at the surface before taking some fluking dives. We’ve id-ed the pair as Cat Eyes and Nimbus. The pair were staying down for a while so we moved on to some other whales in the area and found Touche, Moonlight, and Underline also doing the same behavior as the other two whales. At this point Cat Eyes and Nimbus reappeared just behind our group of three and a little whale traffic jam happened as all five whales moved lazily at the surface almost running into one another. This led to a little tail slashing and trumpeting. 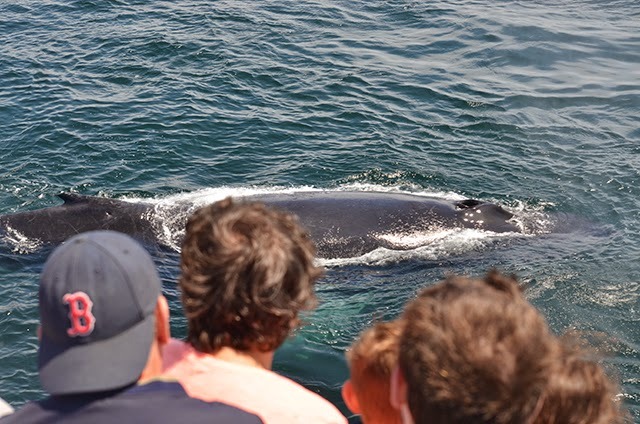 It was interesting to note that three out of the five whales we saw today had a lot of white scaring on their dorsal fins and both Cat Eyes and Underline have large scars on their backs. These scars could be caused by rough behavior on the breeding ground or interactions with humans either through entanglement in fishing gear or collisions with vessels. 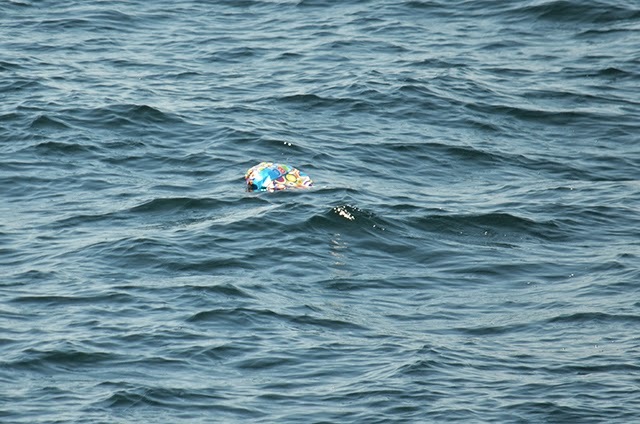 Also talking about human impacts, today we were able to pick up a mylar balloon we came across very close to where we spotted the whales. Balloons, and other items, like plastic bags, are a huge threat to marine animals like whales, seals and especially sea turtles. The animals consume the balloon or bag either thinking that it is a prey item or accidently while feeding. The plastic can build up in the stomach and keep the animal from feeding normally. It was great that we were able to remove this hazard from the ocean today but we all need to do our best to keep them from getting in the ocean in the first place.